(Sept. 21, 2017) -- The University of Texas at San Antonio (UTSA) community will feature its dedication to sustainable living at Equinox Festival '17, from 10 a.m. to 9 p.m. on Friday, September 22. 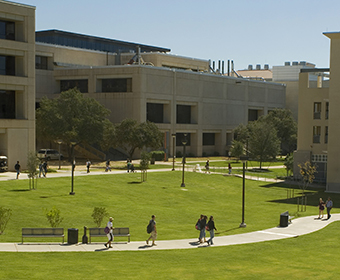 The full day of activities will be held at the H-E-B University Center and University Center Lawn on the UTSA’s Main Campus. Participants are invited to explore information presented by community organizations related to the environment and sustainability efforts. They can visit the electric car exhibit, join a solar panel tour, review research posters and speak to student and faculty researchers, register to vote, play games, eat, listen to music, and give a donation to people impacted by Hurricane Harvey. VIA will showcase its new compressed natural gas bus. UTSA cheerleaders and Rowdy will demonstrate ways to treat our planet better. One of the featured sustainability discussion panels begins at 11 a.m. in the H-E-B University Center Ballrooms (HUC 1.104) with a San Antonio Leadership panel. Scheduled speakers include San Antonio Mayor Ron Nirenberg, UTSA President Taylor Eighmy and UTSA Interim Provost Mauli Agrawal, District 8 Councilman Manny Palaez, and CPS Energy CEO Paula Gold-Williams. Planned panel topics include: operational sustainability, sustainability research, student leadership, transportation, water, climate, cybersecurity, and innovation in sustainability. Researchers at UTSA also have begun work on five new research initiatives to enhance clean energy production/integration, improve air quality and reduce greenhouse gas emissions through the Strategic Alliance between the Texas Sustainable Energy Research Institute (TSERI) and CPS Energy, established in 2010. The new projects are supported by five grants from CPS Energy totaling close to $1.5 million. There will be a check presentation inside the H-E-B University Center Ballroom at 11:45 a.m. The festival concludes with a Community Engagement Roundtable at 6 p.m. Francine Romero, associate dean of the UTSA College of Public Policy, will lead this discussion, focusing on community inclusion in the development of public policy regarding sustainability. The public is invited to come and learn how everyone can make a difference and to see the many ways UTSA and the San Antonio community are working to advance a more sustainable lifestyle and future. Learn more about Equniox Festival '17.